The Lady Cougars scored most of their points at the free throw line and managed to build a four-point lead with two minutes to go, but Moorefield executed a two-minute drill knocking down a pair of perimeter shots en route to dancing away with the Hardy Girls Hardwood Classic 41-36 victory on Friday in the Hive. “We hit some big shots, but everybody contributed to that win. Lindsey [Rinker] hit a big shot and Emma [Baker] comes grabs a rebound and puts it back, then we have Madison [McGregor] with a nice feed from the top,” Moorefield Coach Paul Keplinger remarked. East Hardy’s Julia Hahn netted two foul shots with 2:06 remaining for a 36-32 advantage, adding to the team total of 20-of-32 free throws on the game. On the next possession, Lindsey Rinker nailed a 3-pointer for the Yellow Jackettes and the bench and crowd cheered enthusiastically as the deficit was sliced to one point at 1:53. 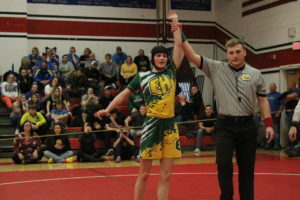 The Yellow Jackettes applied pressure, then East Hardy stalled the clock trying to burn time off and Rinker alertly stepped up the defense to force a five second violation. Moorefield’s Emma Baker struck a 3-pointer for a 38-36 lead with 33 seconds left and the Hive exploded with cheers. 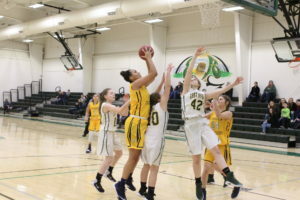 East Hardy’s Lexi Strawderman tried to squeeze through a trap and was fouled by Moorefield’s Nautica Crosco sending her to the charity stripe and neither attempt fell through and Anna Riggleman snatched the rebound for the Yellow Jackettes. Strawderman fouled Rinker with 21 seconds remaining and both shots were added for a 40-36 edge. 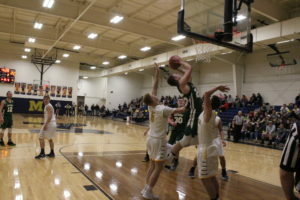 Hahn put up a 3-pointer and it was off the mark with Moorefield retaining possession on a rebound by Crosco and Hahn quickly made a foul with nine seconds on the clock. Crosco netted one of two free throws for a five point advantage, then East Hardy’s Leanna Basye grabbed the rebound and Hahn launched a deep 3-pointer at the buzzer just off the rim for a final in favor of Moorefield 41-36 for the regular season sweep. “The defensive strategy was the same as the last time, but this time they executed it and didn’t fall apart. 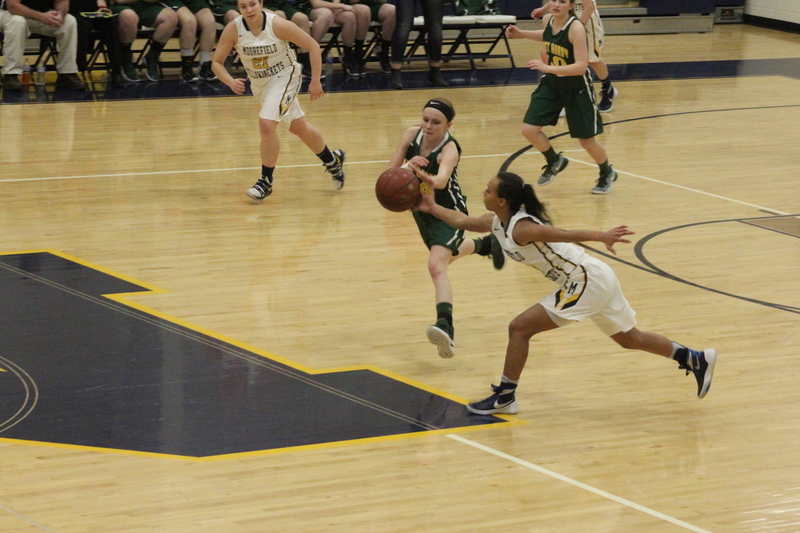 They played well and played good defense,” East Hardy Coach Bridget Billmeyer commented.